The cyclonic storm ‘ROANU’ over Northwest Bay of Bengal moved East-Northeastwards at a speed of 40 kmph during past six hours and lay centred at 0830 hrs IST of 21th May, 2016 over North Bay of Bengal near latitude 21.5º N and longitude 90.3ºE, about 400 km East-Northeast of Paradeep. The system is likely to move east-northeastwards and cross Bangladesh coast close to Chittagong by evening of today, the 21st May 2016 as a cyclonic storm. Forecast : Rain/Thundershower is very likely to occur at a few places over Odisha. Signal lowered at all ports in Odisha. Gusty surface wind speed from Northeasterly direction reaching 45 to 50 kmph with gusting to 55 kmph is likely to prevail along and off North Odisha coast. Sea condition is likely to be rough to very rough along & off North Odisha coast. Fishermen Warning :- Fishermen are advised not to venture into sea in North Odisha Coast. The cyclonic storm ‘ROANU’ over northwest Bay of Bengal moved east-northeastwards at a speed of 25 kmph during past six hours and lay centred at 0530 hrs IST of 21th May, 2016 over northwest Bay of Bengal near latitude 21.0º N and longitude 89.0ºE, about 255 km East-Northeast of Paradeep. The system is likely to move east-northeastwards skirting West Bengal coast and cross Bangladesh coast close to Chittagong by evening of today, the 21st May 2016 as a cyclonic storm. Danger Signal Number Five ( D-V) replaced by Local Cautionary Signal Number Three (LC-III) at Paradeep, Puri and Chandbali Ports and Signal Lowered at Gopalpur Port. Gusty surface wind speed from Northeasterly direction reaching 45 to 50 kmph with gusting to 55 kmph is very likely to prevail along and off North Odisha coast. Sea condition is very likely to be rough to very rough along & off North Odisha coast . Fishermen Warning :- Fishermen are advised not to venture into sea in Odisha Coast. 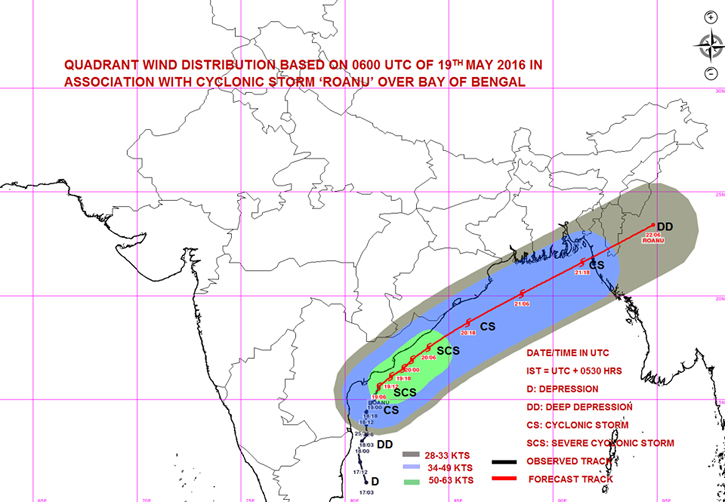 The cyclonic storm ‘ROANU’ over westcentral & adjoining Northwest Bay of Bengal moved Northeastwards at a speed of 30 kmph during past six hours and lay centred at 1130 hrs IST of 20th May, 2016 over same area near latitude 18.4º N and longitude 84.6ºE, about 100 km South of Gopalpur. The system is likely to move Northeastwards along & off north Andhra Pradesh and Odisha coast and intensify into a severe cyclonic storm during next 24 hours. Thereafter, the system is likely to move east-northeastwards and cross south Bangladesh coast between Khepupara and Cox’s Bazar, close to Chittagong in the night of 21st May, as a cyclonic storm. Forecast : Rain/Thundershower is very likely to occur at most places over Odisha. Heavy R/F Warning: Heavy to very heavy rainfall is likely to occur at a few places with extremely heavy rainfall at one or two places over Coastal Odisha and Heavy to very heavy at one or two places over Interior Odisha during next 48 hours. Local Cautionary Signal Number Three (LC-III) kept hoisted at all ports in Odisha. (1) Gusty surface wind speed from Southwesterly direction reaching 90 to 100 kmph with gusting to 110 kmph in South Odisha Coast and from Northeasterly direction reaching 60 to 70 KMPH gusting to 80 KMPH in North Odisha. Sea condition is very likely to be high to very high along & off Odisha coast . Damage to thatched huts, Minor damage to power and communication lines due to breaking of branches and Major damage to kutcha and minor damage to pucca roads over coastal Odisha. The cyclonic storm ‘ROANU’ over westcentral Bay of Bengal moved northeastwards at a speed of 25 kmph during past six hours and lay centred at 0830 hrs IST of 20th May, 2016 over westcentral & adjoining northwest Bay of Bengal, near latitude 18.0º N and longitude 84.2ºE, about 160 km south-southwest of Gopalpur.The system is likely to move northeastwards along & off north Andhra Pradesh and Odisha coast and intensify into a severe cyclonic storm during next 24 hours. Thereafter, the system is likely to move east-northeastwards and cross south Bangladesh coast between Khepupara and Cox’s Bazar, close to Chittagong in the night of 21st May, as a cyclonic storm. (1) Gusty surface wind speed from Northerly direction reaching 90 to 100 kmph with gusting to 110 kmph in South Odisha Coast and 60 to 70 KMPH gusting to 80 KMPH in North Odisha Coast would prevail along and off Odisha Coast but wind speed would increase towards afternoon today. Sea condition is very likely to be high to very high along & off Odisha coast . The cyclonic storm ‘ROANU’ over westcentral Bay of Bengal moved northeastwards at a speed of 16 kmph during past six hours and lay centred at 0530 hrs IST of 20th May, 2016 near latitude 17.2º N and longitude 83.3ºE, about 280 km Southwest of Gopalpur. The system is likely to move northeastwards along & off Andhra Pradesh and Odisha coast and intensify into a severe cyclonic storm by tonight. Continuing moving northeastwards, the system is likely to cross south Bangladesh coast between Khepupara and Cox’s Bazar in the night of 21st/ early morning of 22nd May as a cyclonic storm. Heavy R/F Warning: Heavy to very heavy rainfall is likely to occur at a few places over Coastal Odisha and Heavy to very heavy at one or two places over Interior Odisha during next 48 hours. Distant Warning Signal Number Two (DW-II) replaced by Local Cautionary Signal Number Three (LC-III) at all ports in Odisha. (1) Gusty surface wind speed from Southeasterly direction reaching 60 to 70 kmph with gusting to 80 kmph in South Odisha Coast and 45 to 55 KMPH gusting to 65 KMPH in North Odisha Coast would prevail along and off Odisha Coast but wind speed would increase towards afternoon today. Sea condition is very likely to be high to very high along & off Odisha coast . 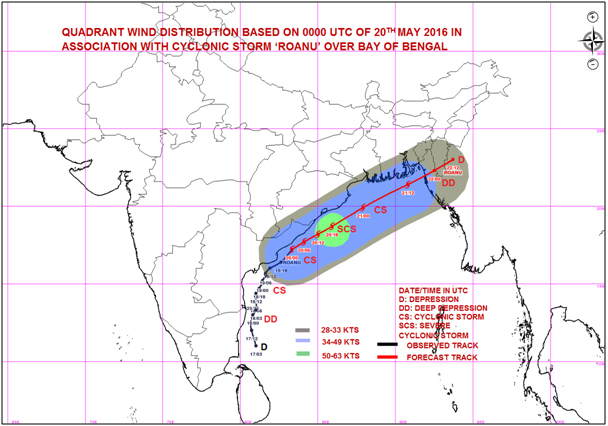 The deep depression over west central & adjoining southwest Bay of Bengal further moved nearly north-northeastwards at a speed of 08 kmph during past six hours and intensified into a cyclonic storm ‘ROANU’, lay centred over west central Bay of Bengal at 0530 hrs IST of today, the 19th May, 2016 near latitude 15.1º N and longitude 81.4 ºE, about 590 km Southeast of Gopalpur. The system is likely to move north-northeastwards along and off Andhra Pradesh coast during next 24 hrs and intensify further into a severe cyclonic storm. Subsequently, the system is likely to move northeast wards along & off north Andhra Pradesh and Odisha during next 48 hours. Forecast: Rain/Thundershower would occur at most places over South Odisha and at many places over North Odisha during next 24 hours. Heavy R/F Warning: Heavy to very heavy rainfall is likely to occur at a few places with extremely heavy rainfall at one or two places over South Odisha and heavy rainfall at one or two places over North Odisha on 19th May,2016. Heavy to very heavy rainfall is likely to occur at a few places with extremely heavy rainfall at one or two places over Coastal Odisha and heavy to very heavy rainfall at one or two places over Interior Odisha on 20th May,2016. Distant Cautionary Signal Number one (DC-I) replaced by Distant Warning Signal Number Two (DW-II) at all ports in Odisha. (1) Gusty surface wind speed from Southeasterly direction in South Odisha Coast and Southerly direction in North Odisha Coast reaching 45 to 50 kmph with gusting to 55 kmph would prevail along and off Odisha Coast today. 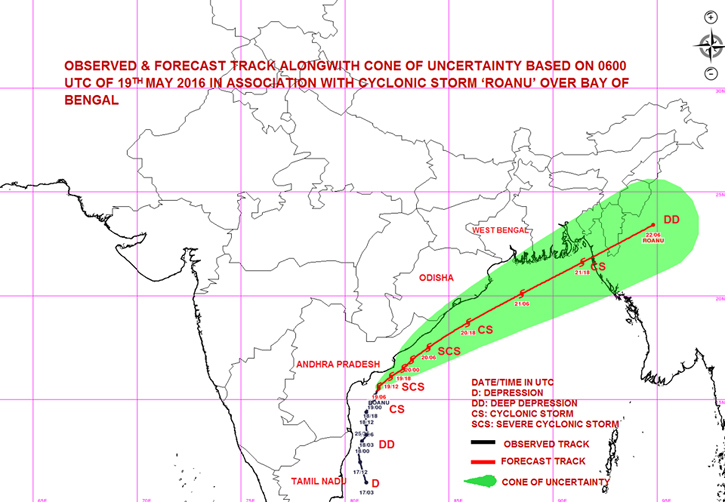 Sea condition is very likely to be high to very high along & off Odisha coast on 19th and 20th May,2016.